In the US thousands of unsuspecting consumers are "taken" every year by unscrupulous fly-by- night "Credit Repair companies." The FTC is supposed to be keeping an eye out for those types of scammers, but unfortunately the FTC only gets involved once they’ve received tens of thousands of complaints. By then it’s too late for the 10,000 + consumers who have lost their hard earned money to those fraudulent "companies." Furthermore, those companies usually steal the consumers' money, and then shut their doors and are never heard of again. And although the FTC sometimes does prosecute the individuals, it’s little solace to know that, while they might go to jail, your money is still gone! The industry needed a sort of "consumer watchdog" to alert consumers from the onset, to act as the first line of defense, help mediate complaints, and warn against thievery. 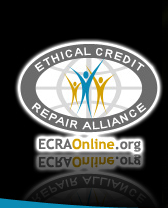 The Ethical Credit Repair Alliance (ECRA) organization is an alliance of credit repair professionals dedicated to self-regulating the profession and discharging their duties in the best interests of their clients. All its members must agree to and abide by the ECRA "Code of Professional Ethics" in addition to Federal Law. Those found to be in violation are subject to expulsion from membership. You might say the ECRA is a kind of "Better Business Bureau" for the credit repair profession, where consumers can file a complaint against any member company. Credit Repair in the US has received a black eye over the years by the flood of crooked "Credit Repair companies". In 2005 the Ethical Credit Repair Alliance Organization was founded by member credit professionals who want to restore trust in the Credit Repair field and give the consumer a voice. The ECRA members abide by a strict ethical code of conduct consisting of 15 conventions and are bound by US federal laws in providing their services to their clients.